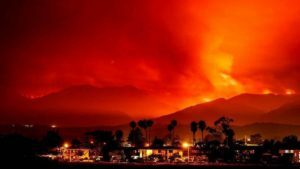 Aon Benfield, the reinsurance arm of global insurance and reinsurance brokerage Aon, has said that the California wildfires could drive an insurance industry loss of up to $8 billion, which, on an aggregate basis, makes it the costliest insured wildfire event ever recorded. Aon Benfield and its catastrophe risk modelling unit, Impact Forecasting, has released its October 2017 global catastrophe report, which includes the devastating California wildfires that claimed 43 lives and injured another 185 people. Aon Benfield cites data from the California Department of Insurance that at least 19,000 residential, commercial, and auto claims had already been filed, resulting in payouts of more than $3.32 billion. Now, Aon Benfield says that this figure is expected to rise to as much as $8 billion as claims continue to come in, with the economic cost expected to be even higher. “On aggregated basis, this is the costliest insured wildfire event ever recorded,” says Aon Benfield. The $8 billion overall insurance industry loss from the event is at the top end of the RMS range, which said that economic and insured losses, which it expects to be similar owing to high penetration of wildfire protection in the state, are expected to be between $6 billion and $8 billion. With insurers and reinsurers having reported declines in profits in the third-quarter, with many falling to underwriting losses as a result of high cat losses, it will be interesting to see what impact the wildfire losses have on both individual companies and the broader marketplace as the January renewals approach. Some players have already announced their expected hit from the California wildfires, with AXIS Capital expecting a hit of up to $45 million, Beazley saying that it expects the event to increase its Q3 cat loss estimate by up to $25 million, while Travelers has said that after reinsurance recoveries, it expects to experience losses of $675 million from the wildfires.